An elusive species of endangered wild cat has made a stunning new appearance on film in a place where he's never been seen before. 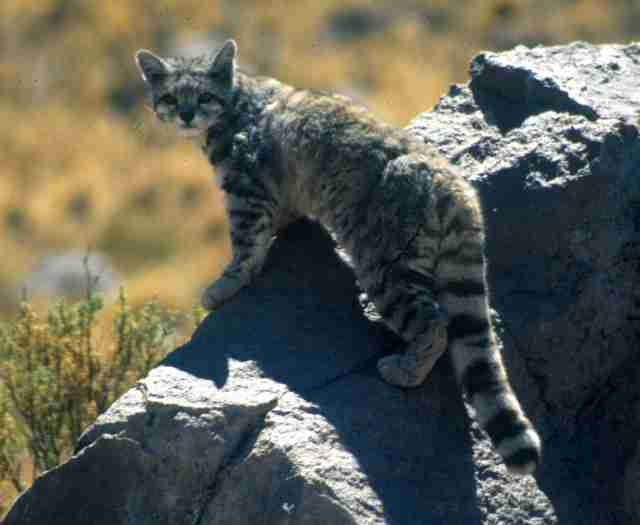 Andean cats, native to mountainous regions in northern Chile, are considered one of the world's most endangered and little-studied felines. The species is so mysterious, in fact, that only a handful of photographs have ever been taken of them in the wild over the decades since they were first discovered, offering very few clues about their habits or distribution. 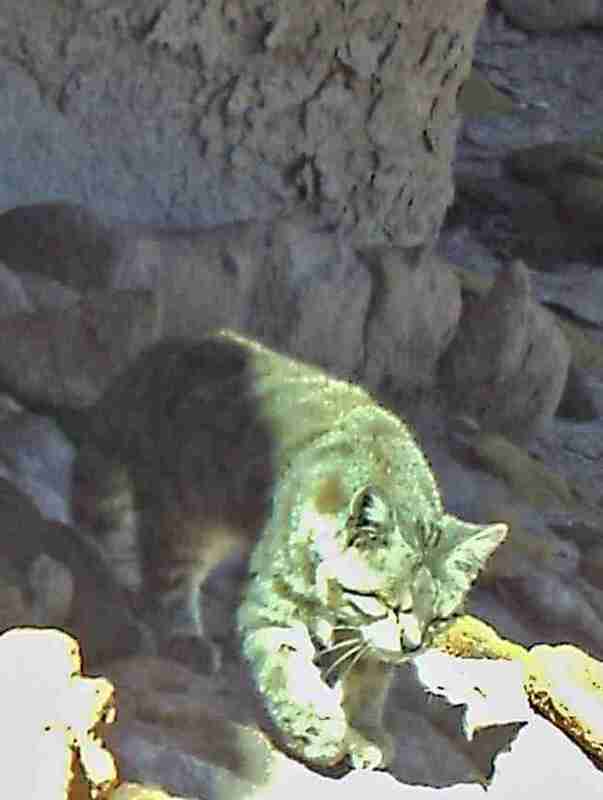 Now new images have emerged showing the little cats thriving in yet another rocky Chilean outpost where, despite years of extensive surveys in the region, they had never been observed previously. 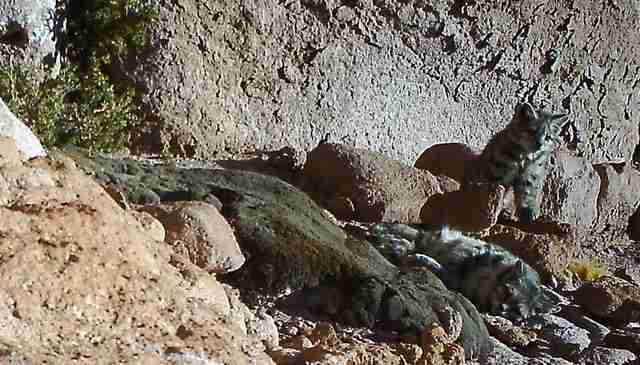 Earlier this month, camera traps in the rugged landscape of Los Flamencos National Reserve captured a series of photos of two healthy-looking Andean cats - a lounging mother and her rambunctious offspring. For researchers from the National Forestry Corporation (CONAF), working in collaboration with the Andean Cat Alliance, this photographic evidence couldn't come as better news, suggesting the rare species may indeed be more robust than had been suspected. "This is a very significant sighting because we had though that Andean cats lived only in one part of northern part of Chile," CONAF biologist Mariano de la Maza told The Dodo. "Now we know the cat has a larger distribution than we thought before." Given the rarity of such sightings, population estimates are believed to be below 2,500 individuals and in decline. 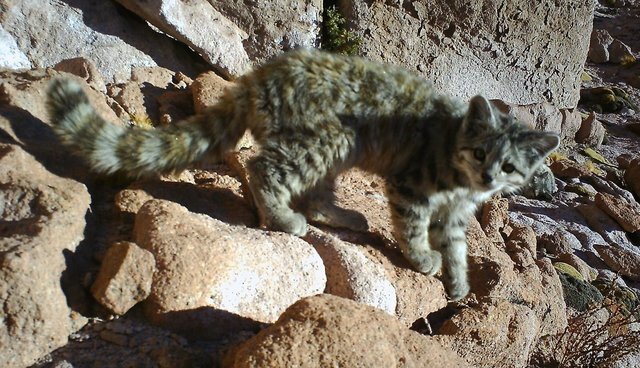 Andean cats are imperiled by a number of human factors, like encroachment in the regions they call home, which makes documenting where they do exist a key component of saving them. "This is one of the five most endangered cats worldwide, but we have to know where it is present so we can protect it," said Maza. "With this sighting, we can now form a new conservation plan for them based on the the information we have."